Life Factory's large (17 oz / 500 ml) glasses are a fun friend of the reds and they also work well with iced tea, lemonade and juices! Life Factory&apos;s large (17 oz / 500 ml) glasses are a fun friend of the reds and they also work well with iced tea, lemonade and juices! 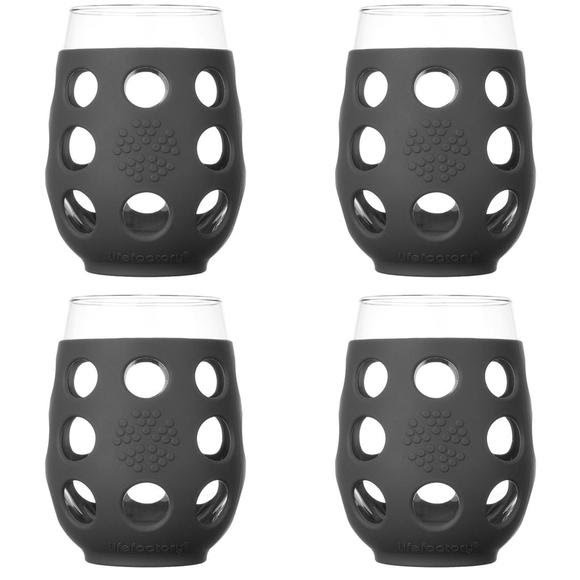 Life Factory glasses are dishwasher safe with the sleeve on. For safety reasons, removing the sleeve is not recommended. Place the entire product in the dishwasher or hand wash with warm soapy water. Any liquid between the sleeve and the glass will air dry. If you notice any cracks or chips in the glass please safely dispose of the glass immediately. We love these glasses because we often break others! Although, we still at times do with these, they don't shatter everywhere!